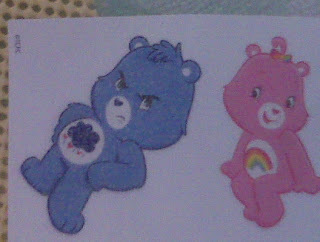 Life with Giggles: A mean Care Bear? That's grumpy bear! He's my favorite. He was always having a bad day. And on that sticker, he looks especially annoyed! *lol* Oh grumpy bear... I don't remember if I liked him as a kid, but there are definitely plenty of days now when he's my care bear of choice!